Astronaut photograph ISS056-E-62768 was acquired on June 29, 2018, with a Nikon D5 digital camera using an 800 millimeter lens and is provided by the ISS Crew Earth Observations Facility and the Earth Science and Remote Sensing Unit, Johnson Space Center. The image was taken by a member of the Expedition 56 crew. The image has been cropped and enhanced to improve contrast, and lens artifacts have been removed. The International Space Station Program supports the laboratory as part of the ISS National Lab to help astronauts take pictures of Earth that will be of the greatest value to scientists and the public, and to make those images freely available on the Internet. Additional images taken by astronauts and cosmonauts can be viewed at the NASA/JSC Gateway to Astronaut Photography of Earth. Caption by Andrea Meado, Jacobs Technology, JETS Contract at NASA-JSC. 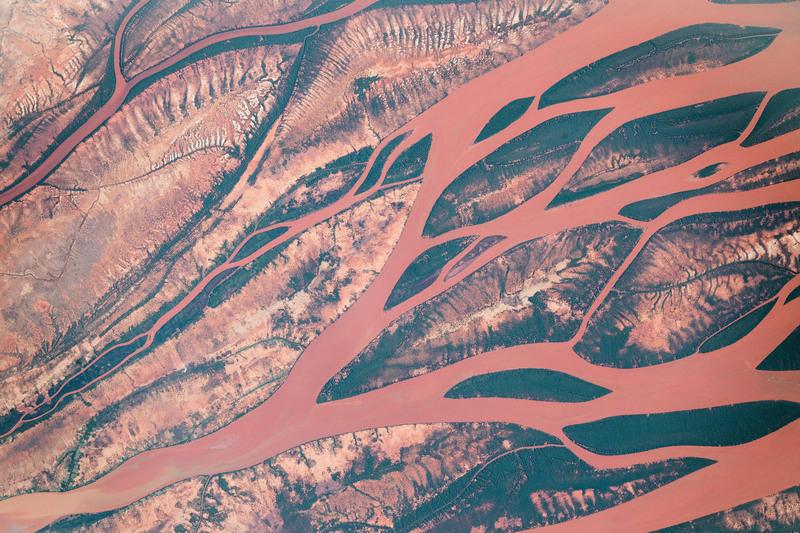 An astronaut aboard the International Space Station (ISS) shot the photograph of the Betsiboka River Delta in Madagascar. The braided Betsiboka River carries sediment from the island’s high central plateau and mountains toward the western coast, where it empties into Bombetoka Bay and the Mozambique Channel. The delta is comprised of complex woven channels flowing between vegetated islands of built up sediment. The small islands have erosional features along their edges where water flows down into the river channels. 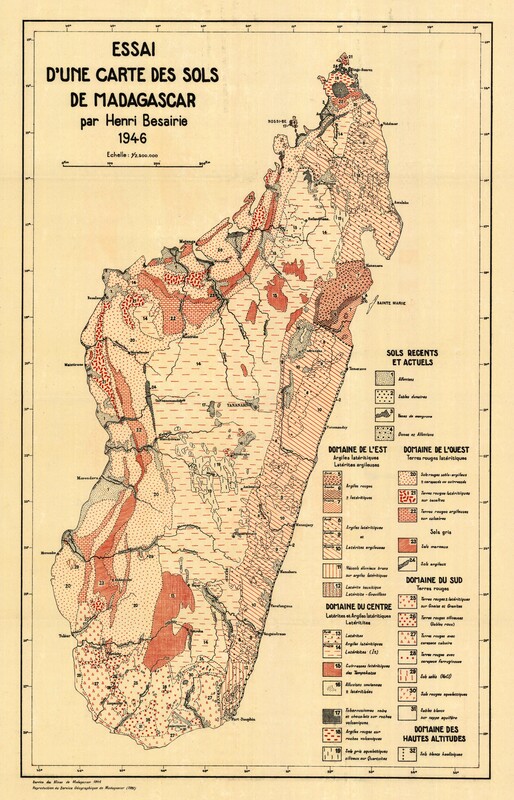 Historical maps of Madagascar describe the sandy to clay-rich soils around the Betsiboka River as terres rouges, or “red lands.” (The island was a French territory from 1895 to 1960.) They were describing laterites—soils rich in iron oxides—that form in tropical climates from the chemical breakdown of iron-rich rocks. These soils and sediments lend the river a rusty orange color when the island experiences heavy seasonal rain or downpours from tropical cyclones. More than 30 years of astronaut photography have captured the delta evolving and islands growing from this sediment. The heavy sediment loads in the waters are also a result of extensive deforestation on the island since the 1950s. Since that time, at least 40 percent of Madagascar’s forest cover has been cut down. Slash-and-burn agricultural practices, livestock overgrazing, and wildfires have dramatically altered the island’s mangrove forests. So the Betsiboka River now cuts across thick, unstable soils that are prone to erosion. Mangrove trees create the dark areas within the small lenses of land. Mangroves thrive in estuaries, where salty sea water mixes with fresh water from the Betsiboka. The landscape helped Madagascar develop rich biodiversity, with a high number of plant and animal species endemic only to the island. This image originally appeared on the Earth Observatory. Click here to view the full, original record.